Long time no see! I have a bulkier blog post today with a number of things that I want to talk about. First off, BCM is entering its final stages of development. The rough draft of the script was finished some months ago, but I’m currently working on heavily revising it, particularly the endings and epilogues. The problem with writing a script over a 4-year period is a lot of the old writing doesn’t really match up with the new; even the characterizations are a bit off. Auro is done with pretty much everything art-wise other than the CGs at this point, which is what she’s hammering out now. While she’s working on those, I’m fixing up the script as best as I can. I’ll have some directing (that is, matching sprite expressions to dialogue) to do once the script is finished, too, but from experience that shouldn’t take me too, too long. If all goes well, we’re looking at a release later this year! In other news, 3 days from now I’ll be headed to Australia to visit Auro. I’m spending a whole month there and I’m really excited about it! I’ve never been outside of the US and I’ve also never flown on a plane by myself. I’ve never done a lot of the things that I’m planning to do on this trip, so I just know it’s going to be a great experience. Of course, I’m bringing along my laptop, too, so while I doubt I’ll be at my usual level of productivity, I do want to get some work done while I’m down under. We’re going to see The Lion King at the theatre, too, so I’m super duper excited. I’d like to take some time to talk about this design document template that I made up a while back. The first version of it that I came up with was for Ristorante Amore. Back when we first started with Cyanide Tea, Auro and I mostly communicated via Google Docs. So having a document that we could pass back and forth was really crucial in the planning stages. The template went through a lot of changes every time I used it, but it’s been in this form for the last three projects I’ve worked on (Taarradhin, the Blind Griffin, Spirit Parade). People often ask me about how I organize my ideas for projects or how I plan things out…and this is it! 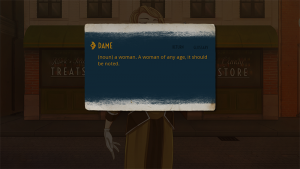 The story and character sections are important, of course, but I think the art assets part at the end is crucial, too. It’s a good way of keeping scope in mind. If I can see a list of (potential) BGs at a glance, I can figure out how many scenes can take place in each one and maybe eliminate BGs that are less useful. Passed back and forth between your team members, you end up with a really good way to see the skeleton of your project at a glance and cut the fat when you can. It’s also great for making sure that everyone’s on the same page. 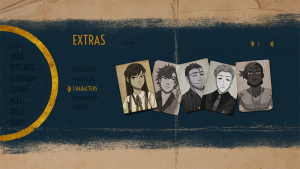 Finally, I’d like to talk a little bit about this year’s NaNoRenO. Auro and I teamed up with Noyemi K and Rins to form Asphodel Quartet this year and we released the Blind Griffin. I had planned out a long postmortem on the game, but in the end I think it’d be most useful for myself and others if I just talked about two things: the challenges I came up against and the lessons I learned from working on it. I’m going to present these in list form. there’s no point in giving up 2-3 days’ sleep just to try and get something done. chances are you either won’t get it done or it will be done extremely poorly. there’s no point in finishing a game if you ruin your health while doing it. always have a time buffer when scheduling work on your projects. in a game jam, you absolutely WILL end up with at least a few days where family drags you out or you get sick or something unforeseeable happens, so don’t plan on working every single day. related to the above point, if you find yourself with some extra time one day, use that time to do some more work on your project instead of taking off early! you might be very glad you did later. if you think you’re being funny, you’re probably not. if you don’t think something you’ve written is funny, there will be at least one person out there who thinks it’s hilarious. 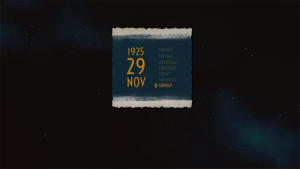 It’s the roaring 20’s. Alcohol-loving Americans are chafing underneath the restrictions of Prohibition, but speakeasies have thankfully risen to fill the void with ill-begotten booze. 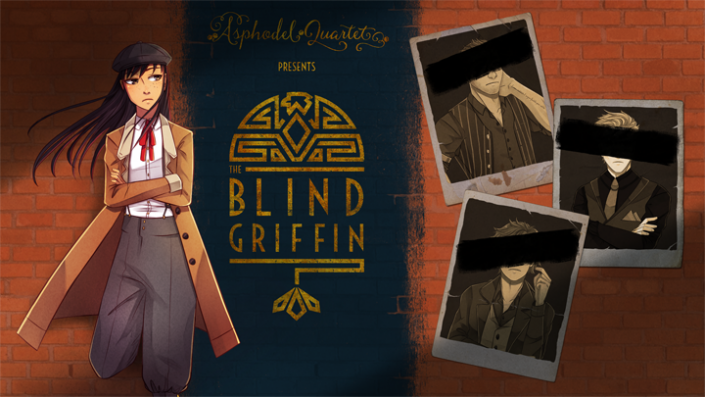 The Blind Griffin is one such speakeasy in San Francisco, California, but it’s about to go out of business…because its employees are a den of magicians who are more concerned with their magical studies and experiments than moonshine! Desperate not to lose the building that has become their haven, they hire the first streetsmart guttersnipe they find with some experience to help turn things around, but could she perhaps turn out to be the strongest magician of them all? This game has 10 endings and 6 CGs. All writing/programming was done by me, Lorelei. The art was a joint effort between Auro-Cyanide and Rinslettuce. Noyemi K was our music composer. For more information about the game and to download, please see the official website. 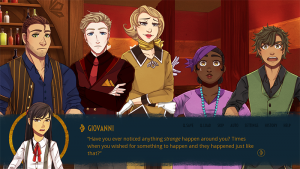 So since it’s March, I obviously had to talk about Nanoreno! For those unfamiliar with the event Nanoreno, it’s basically a month long game jam held by the Visual Novel community in March each year where you create a game from scratch. This is my 5th year participating and honestly one of the highlights of my year. This year we are working on an otome set in the 1920’s about a group of misfit magicians trying to run a speakeasy. Check it out! I will say right off that Nanoreno is a fantastic event for Visual Novel creators, experienced and new. There is always something you can learn doing something within a short deadline and I highly recommend everyone to try it out whenever you get the chance. The experience is truly invaluable.